If there's anything that'll create dark spots quickly on your skin it's sun and oxidative stress brought on by pollution, so needless to say the hot, hazy and humid conditions Vancouver's been experiencing lately have been less to kind to complexions. But beyond that, I find that as summer transitions to fall and tans begin to fade, dark spots and unevenness start appearing—evidence of less-than-stellar SPF habits. Thank goodness for products like the new Caudalie Vinoperfect Concentrated Brightening Essence ($50 at BeautyMark), which is designed to be used in conjunction with their cult-fave Caudalie Vinoperfect Radiance Serum ($89 at BeautyMark). Combined, these products effectively yet gently brighten, lighten, and even out the skin, relying on naturals-heavy formulas to do so. Founder Mathilde Thomas was inspired to create Caudalie Vinoperfect Concentrated Brightening Essence after living in Asia and observing the meticulous multi-step skincare regimens of Korean women. An essence is applied immediately after cleansing to prime skin to better absorb serums and creams. 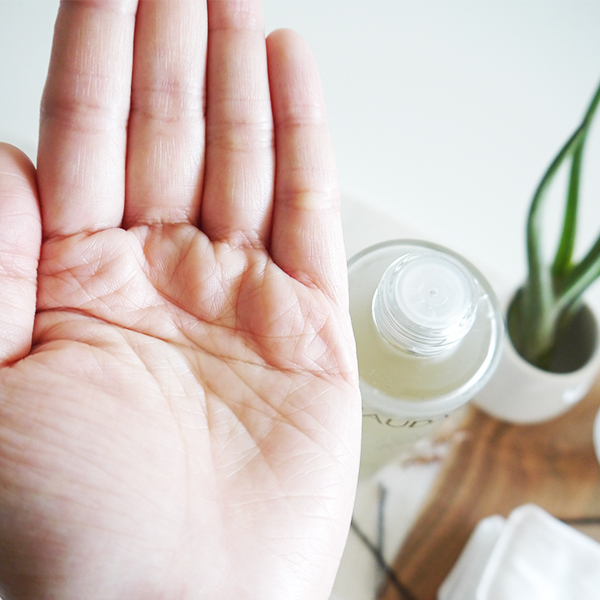 Think of a lightweight, watery substance you'd use in place of a toner, something that is filled with active ingredients like a serum but also hydrates and plumps the skin. Essences, Thomas observed, played a huge role in maintaining the smooth, translucent complexions that Koreans crave. True to Caudalie's brand identity, their take on a brightening essence harnesses the power of nature to bring radiance to the skin. The formula contains no parabens, phenoxyethanol, phthalates, mineral oils, sodium laureth sulfate, and animal ingredients. Actives include glycolic acid to exfoliate dead cells, white peony to brighten and even out skintone, and grape water to hydrate and soothe. As someone who's trying to go greener with her beauty routine out of health concerns, I love that I can get brightening results from safe, natural and effective ingredients, instead of goodness knows what goes into some of the other brightening products on the market. As you can see from the photo below, the Concentrated Brightening Essence looks just like water. It even feels like water when applied, absorbing quickly with no residue or film—just a light orange blossom scent and a feeling of instant refreshment and hydration. You can use a cotton pad or do what Asian women do and press the product into skin with your bare palms and fingers. (Personally, I prefer the latter as there's less wastage.) 5 drops for each side of my face and 5 drops for my neck is more than sufficient. The 50 ml bottle is huge—I've been using my review sample since June and only about a tenth of it is gone, which means one bottle should last all year. 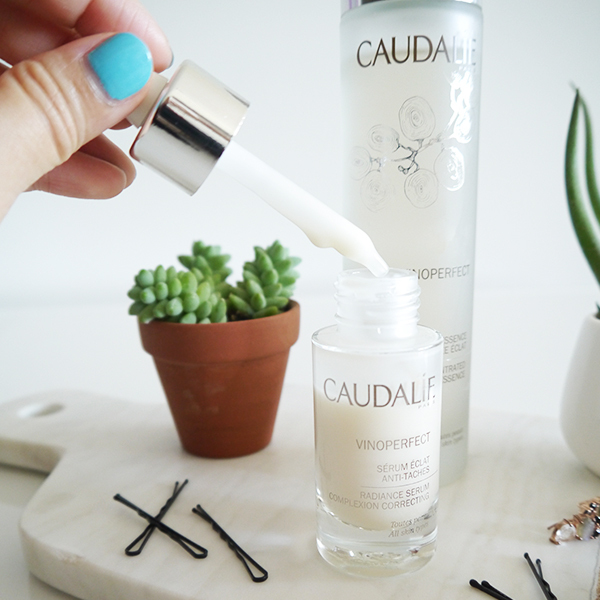 Of course, the Concentrated Brightening Essence shouldn't be used alone—one of its key purposes is to prepare the skin to receive the active ingredients of Caudalie Vinoperfect Radiance Serum and make the latter work even better. This was my first time using the Radiance Serum, and I loved its milky lightweight texture. The formula is mostly natural and features viniferine, a substance found in grapevine sap that's supposed to be more effective than vitamin C at brightening. The dropper bottle allowed me to dispense the perfect amount—one drop for each side of the face, one drop for the front of my neck—in a sanitary way without wasting anything. So, can you use one product or the other? Yes, but they are definitely better together. Think about it—one product exfoliates and hydrates and brightens as the first step, and prepares skin to receive the potent viniferine in the second step and all the brightening benefits it confers. The textures of both work together so harmoniously with each other and layered under other products. I hate heavy, sticky, rich, or silicone-laden formulas that don't fully absorb and then layering other serums or moisturizers on top of that. 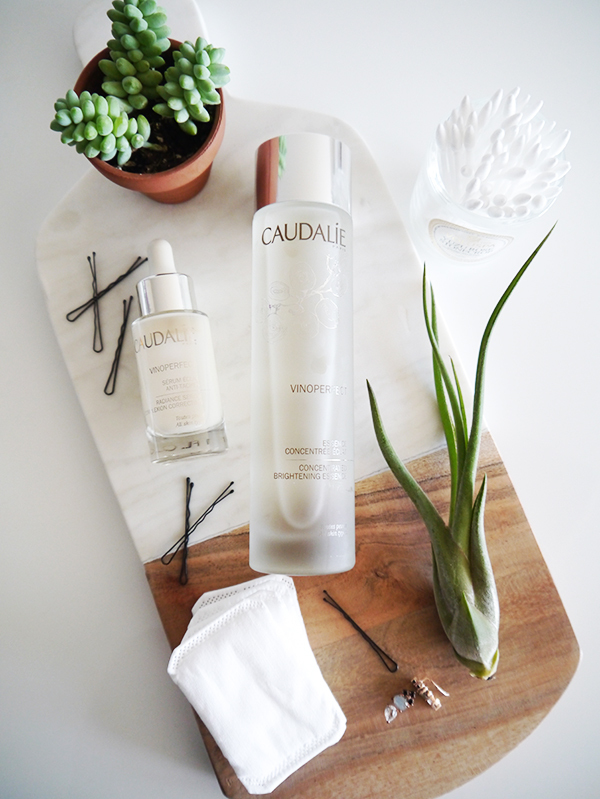 This is definitely not the case with this Caudalie Vinoperfect duo. Results-wise, there's no way to tell where the effectiveness of one product ends and the other product begins, but there have been results in the last two months of testing. The dark spot under my right cheekbone is less noticeable, and even though my skin has been more prone to breakouts and congestion than usual this summer, any dark spots that blemishes have left behind have been fading faster. Elsewhere on my forehead and cheeks, the essence and serum immediately calm ruddiness when first applied and make my skin look more even-toned. So far I've only been using these products after nighttime cleansing, but as we head into fall I may step it up and use them AM and PM. After all, nothing sets off a beautiful, rich, deep lip colour like a flawless complexion.